Natural brines are waters with very high to extremely high concentrations of dissolved constituents—elements, ions, and molecules. Brines are commonly considered to be those waters more saline, or more concentrated in dissolved materials, than sea water (35 grams of dissolved constituents per kilogram of sea water). Brine can contain salt concentrations more than five times greater than the salt content of average sea water. Natural mixtures of brines, sea water, and fresh waters occur at various locations. Owing to high concentrations of dissolved components such as sodium and magnesium, brines are of commercial interest, especially in the production of table salt. Subsurface caverns (especially those used for the mining of table salt), saline lakes (e.g., the Great Salt Lake, the Dead Sea, the Salton Sea), and the saltwater ocean are three principal sources of brine. Despite their economic value in some circumstances, brines may cause considerable trouble where they leak into potable (drinkable) water supplies or contaminate water for animals, crops, gardens, and other landscaped terrains. In the ocean, brine is formed by several processes: evaporation, formation of sea ice, and solution of salt domes. One of the more common processes is by evaporation. Evaporation is greatest in shallow or stranded regions of sea water, where the energy of the Sun evaporates some water, concentrating the salt. The process where the solvent (water) is removed from the system is known as evaporite formation, and the resulting rock is called an evaporite. Evaporites are common in the geologic record. Brines are waters containing extremely high concentrations of dissolved constituents, including salt. This image conceptualizes the abundant salt that can be precipitated from a brine solution. Another process by which ocean brines arise is through the formation of sea ice. As sea water begins to solidify, some of the saltier, denser water (brine) drains to underlying water. As the ice thickens, the brine can become trapped in pores known as brine pockets. This effect further concentrates the brine. Brine pockets are typically less than half a millimeter in diameter, but can extend downward into the ice for some distance. The presence of brine pockets influences the mechanical properties of sea ice in ways that are not yet fully understood. 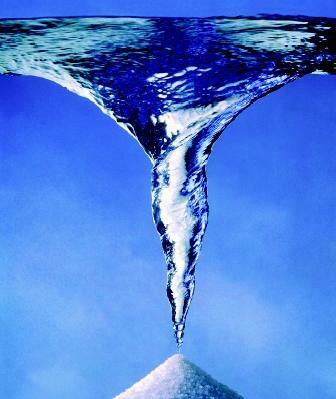 As the ice structure changes, more water is extruded from the pores, increasing the salt concentration of the brine in the pore space up to eight times that of typical (liquid) sea water. At this extreme concentration, the sodium and chloride are supersaturated, and so begin to precipitate as salt crystals. Concentration processes in the ice pores may continue, resulting in a slurry or a gel. At very high salt concentrations, sodium chloride crystals (halite) form, as can crystals containing chlorides of other salts such as calcium and magnesium. Brine can form by the aqueous solution of evaporite deposits such as those found in salt domes. A salt dome is a geological structure where very deep deposits of relatively "plastic" salt flowed upward through the bedrock owing to the great pressure of this overlying rock and sediment. The salt may break through the rock and sediment layer, protruding with a dome-like shape, thus giving the structure its name. Salt domes are a distinctive feature of the Gulf of Mexico, in particular the central region of the gulf called the Orca basin. The solution at the bottom 150 meters (492 feet) of the Orca basin is not sea water but a highly concentrated brine with little or no free oxygen. A layer of salt formed at the Orca basin during the Jurassic Period of Earth's history. * The salt was eventually extruded, under tremendous pressure, through overlying layers of sediment toward the surface, forming salt domes. Oil and gas included in these sediments may be pooled and trapped by salt dome structures and form attractive targets for energy exploration. There are more than 500 known salt domes in the Gulf Coast region. Some of these originate from the salt layers that are many kilometers underground. In the Orca basin, salt domes on the sea bottom expose the salt to the sea water. Where the salt dome interacts with the sea water, solution of the dome can occur as salt dissolves in water. The extreme salinity of the area immediately surrounding the salt dome, however, will create a pool of salt water that is denser than the surrounding sea. This extremely salty water, or brine, leaks from the area of the salt dome into surrounding depressions on the sea floor, creating brine pools. Natural brines are commonly found at depth in the Earth, but they also are found at Earth's surface, most notably as a byproduct of oil and gas test wells and production wells; hence they are known as oil-field brines. As petroleum and gas is commercially produced, brines may be produced in large quantities. In oil fields that have been producing for long periods of time, such as in central and west Texas, wells may produce hundreds of barrels of brine for every barrel of oil. Oil-field brines must be disposed of in such a way that drinking waters and waters for other uses are not contaminated. Historically, brines would be dumped into a pit and commonly they would appear to "evaporate" or otherwise go away. In too many cases, however, the brines were simply seeping downward into the subsurface rocks, and contaminating the local aquifer . Because groundwater in most places moves slowly, perhaps several millimeters a year, many years might pass before nearby water wells became contaminated. Lawsuits commonly followed. SEE ALSO Fresh Water, Physics and Chemistry of ; Groundwater ; Mineral Resources from Fresh Water ; Mineral Resources from the Ocean ; Ocean Chemical Processes ; Sea Water, Freezing of ; Sea Water, Physics and Chemistry of . Drever, James I. The Geochemistry of Natural Waters: Surface and Ground Water, 3rd ed. Upper Saddle River, NJ: Prentice Hall, 1997. Holland, Heinrich D. The Chemistry of the Atmosphere and Oceans, 2nd ed. New York: Wiley-Interscience, 1984. Lewis, Richard J. Sr., ed. Hawley's Condensed Chemical Dictionary, 13th ed. New York: John Wiley & Sons, 1997. * See "Petroleum from the Ocean" for a photograph of an offshore oil rig.